Dame Janice Pereira was appointed to the JLSC in accordance with section 105(1)(a). The Honourable Janice Mesadis Pereira, DBE, was appointed as the Chief Justice and President of the Court of Appeal of the Eastern Caribbean States in 2012. Prior to this appointment she served as a Court of Appeal Judge of the Eastern Caribbean Supreme Court from 2009-2012 and a High Court Judge of the Eastern Caribbean Supreme Court from 2003-2008. Dame Pereira graduated from the University of the West Indies, Cave Hill Campus, Barbados with a LLB (Honours) in 1979 and completed the Legal Education Certificate at the Norman Manley Law School in Kingston, Jamaica in 1981. She was called to the Bar in the British Virgin Islands in 1981 and also in St. Kitts and Nevis in 2000. 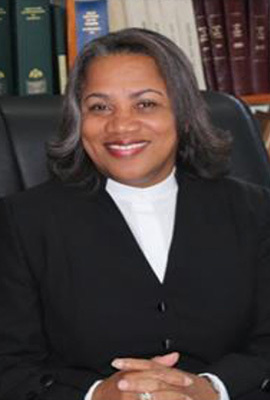 Dame Pereira served as the Registrar General [Ag] and Registrar [Ag] of the Supreme Court, BVI and the Registrar of Companies, BVI; whilst simultaneously serving as an Acting Magistrate in BVI. From 1985 – 1989 Dame Pereira worked as an Associate Attorney at Law initially at J S Archibald and Co. and then at Harney, Westwood & Riegels before working as an Attorney in Civil Litigation, Commercial and Banking at McW Todman & Co from 1989-1990, and a partner at Farara George-Creque & Kerrins (Formerly Farara & George-Creque) (Commercial – Litigation/Non Litigation, Conveyancing, Probate and Family, Corporate, Admiralty from 1991-2003. Dame Pereira is the current Chair of the Judicial and Legal Services Commission of the Organisation of Eastern Caribbean States (OECS) as well as the British Overseas Territories in the OECS; and a member by virtue of her Office, of the Regional Judicial Services Commission in respect of the Caribbean Court of Justice. Dame Pereira has been appointed as a member from 1 August 2015 – 31 July 2019.